A chakra is a spinning vortex of activity created by the presence of consciousness within the physical body. These vortices exist within what is called the subtle body – a hidden field of energy that carries your urges, emotions, and habits, as well as the imprints of all that has happened to you. As vital portals between mind and body, the chakras can be thought of as chambers in the temple of the body that organize various elements of your life force as it travels through you. Like the rooms in your home, chakras are areas in the body that take in energy from outside, process that energy internally, and express it back out again. In this way, chakras are centers of organization for the reception, assimilation and expression of life force energy. Classically, there are seven major chakras whose locations correspond to seven central nerve ganglia branching out from the spinal column. Each of these nerve bundles influences the subtle or energy body as well as the physical body. 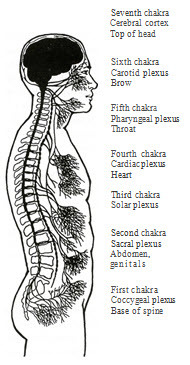 Some interpretations of the chakra system postulate more or fewer chakras, but for this map we will stick with the elegance of the seven major chakras that match the structure of the nervous system, as shown here. Just as the electricity running through your computer allows your software and your hardware to work together effectively, the mind (software) and the body (hardware) are brought together by the life force running through you. Some call this energy prana, chi, charge, or subtle energy, but these are all words for the same basic life force. It is this vital energy that the chakras organize. The seven chakras, along with the many highways and back roads that connect them, comprise the energy body -that mysterious essence that makes you uniquely alive. The word chakra comes from Sanskrit and means wheel or disk, as the chakras are commonly experienced as spinning wheels of energy. In the computer analogy, the chakras can be thought of as programs on a floppy disk, installed into our hardware, which influence the flow of the life force. We each have several programs installed: a survival program that tells us when to eat or rest; a sexual program with our morals and preferences; a relationship program . . . This entry was posted in Balance, Chakras, Life and tagged body, chakras, consciousness, Judith Anodea, Light. Bookmark the permalink. Hello, I love this image of the nerves and the chakras! Can you tell me where you found it? I’d like to share it and give credit. Thanks! Lisa, I would like to know the source as well. I find most of the images I use doing keyword or phrase searches on Google or Pinterest. I wish I had the resources to discover and credit the sources – on my Christmas list. If you find the source for this or any other of the images, I will joyfully create an acknowledgment post and broadcast with fanfare. Thanks, David, I’ll keep you posted and please do the same if anything turns up!